Although he is known for translating the Book of Mormon, many people are not aware that Joseph Smith also translated some of the Bible. Strictly speaking, what people now call the Joseph Smith Translation (JST) is not a translation but rather a series of revelations expounding on and correcting what he said were errors in the King James Version. The Prophet never claimed to have the original Biblical documents. There is some dispute among people who believe in the prophetic calling of Joseph Smith about the JST. The Community of Christ group and its Restoration Branches group has the most complete version of the document which it published as the Inspired Version of the Bible. The Utah-based Church of Jesus Christ of Latter-day Saints has portions of the original work which are integrated as footnotes and appendices in officially published scriptures. Most LDS believe the JST is an authentic, inspired addition/correction to the King James Bible. Officially speaking, the LDS church has not addressed any of the controversies surrounding the Inspired Version, however, apologists have argued that the purpose of the JST was not to "correct" the Bible but rather to clarify and expand on it. The JST is significant in Mormon history because it contains some evidence that what Joseph said was the correct translation of the Bible actually contradicts several sections of the Book of Mormon which deliberately mirror the King James Bible. Known errors in the Biblical text are also preserved in the JST. Additionally, why was the translation project, which was never quite finished by Joseph, never undertaken by any subsequent church leaders, each of which is supposed to be a "seer, a revelator, a translator, and a prophet?" "The JST to some extent assists in restoring the plain and precious things that have been lost from the Bible" "Joseph Smith Translation (JS)," Bible Dictionary. Link is here. "And again, the duty of the President of the office of the High Priesthood is to preside over the whole church, and to be like unto Moses- Behold, here is wisdom; yea, to be a seer, a revelator, a translator, and a prophet, having all the gifts of God which he bestows upon the head of the church." D&C 107:91-92 Link is here. Does JST conflict with BOM? Did Joseph finish the JST? Although many Christian churches claim that the Holy Bible is 100% correct and error-free, it does have some translation errors. Under inspiration from Heavenly Father, Joseph Smith re-translated select passages of the King James Version of The Holy Bible, including an entire chapter of Matthew (Mark, and Luke were also written out in full but not included in the LDS version of the JST). In 1979 the LDS Church published an edition of the King James Version with hundreds of Joseph Smith Translation (JST) footnotes and a seventeen-page appendix containing JST excerpts. The re-translated passages are given at the bottom of pages of the Bible that contain the scriptures that Joseph re-translated. The Joseph Smith Translation of these verses is correct and they are what was in the original scriptures as penned by the original prophets thousands of years ago. 8th Article of Faith: We believe the Bible to be the word of God as far as it is translated correctly; we also believe the Book of Mormon to be the word of God. "AUTHORITY TO TRANSLATE. The Prophet Joseph Smith claimed a divine appointment to make an inspired rendition or, as he termed it, a "new translation" of the Bible. This appointment can be illustrated by excerpts from his writings. After laboring off and on for ten months on the early chapters of Genesis, Joseph Smith received a revelation from the Lord on March 7, 1831, directing him to begin work on the New Testament: "It shall not be given unto you to know any further concerning this chapter, until the New Testament be translated, and in it all these things shall be made known; wherefore I give unto you that ye may now translate it" (D&C 45:60-61). The manuscript of the JST shows that Joseph Smith began the translation of Matthew the next day. On December 1, 1831, the Prophet entered the following in his journal: "I resumed the translation of the Scriptures, and continued to labor in this branch of my calling with Elder Sidney Rigdon as my scribe" (HC 1:238-39). On February 16, 1832, he reported a revelation concerning the resurrection of the dead that includes the following reference to his divine commission to translate: "For while we [Joseph Smith and Sidney Rigdon] were doing the work of translation, which the Lord had appointed unto us, we came to the twenty-ninth verse of the fifth chapter of John" (D&C 76:15). On March 8, 1833, he reported the word of the Lord to him as follows: "And when you have finished the translation of the [Old Testament] prophets, you shall from thenceforth preside over the affairs of the church" (D&C 90:13). On May 6, 1833, Joseph Smith reported the following revelation: "It is my will that you should hasten to translate my scriptures" (D&C 93:53). It is clear that Joseph was not just "making clarifications" in the Bible. He was "translating" it and restoring the many precious truths that were lost. The italicized words in the King James Bible are words that were added by the translators to help the reader. This is usually necessary when translating from one language to another because word meanings and idioms change. So, to produce a more readable translation, the King James translators (1604- 1611) added certain words to the Bible text. However, to make sure that everyone understood that these words were not in the available manuscripts they set them in italics. Joseph likely knew this and a large portion of the newly translate Bible passages contain these italicized words. Reference: David P. Wright, "Isaiah in the Book of Mormon, or Joseph Smith in Isaiah" in American Apocrypha: Essays on the Book of Mormon, D. Vogel and B. Metcalfe, eds. (Salt Lake City: Signature Books, 2002), 157–234. Does the Joseph Smith Translation of the Bible conflict with the Book of Mormon? Joseph Smith corrected the Bible. In doing so he also corrected the Book of Mormon. The Book of Mormon is the most correct book and was translated a mere decade before the JST. The BOM was not corrupted over time and did not need correcting. How is it that the BOM doesn't match the JST? There are additional examples of these inconsistencies between the KJV, BOM and JST. Critics contend that Joseph didn't get the idea to change these scriptures until after the BOM was published so he couldn't go back and make the BOM passages the same as his re-translated Bible passages. Notice the most striking change, in which Smith changed the One who smelled the odor arising from Noah's sacrifice from the LORD, as the KJV tells us, to Noah himself. What makes this change so damning is that throughout Scripture, both Old Testament and New, only God is said to be the One who smells the aroma of a sacrifice. This is the case approximately 45 times in the Old Testament (such as Exodus 29:18, Leviticus 1:9, Numbers 15:3, and Ezekiel 16:19), and 3 times in the New Testament (2 Cor. 2:15, Eph. 5:2, and Phil. 4:18). The Hebrew word "sweet-smelling" is nichowach and refers to a soothing or tranquilizing property on the part of the aroma. The point, then, of the "sweet-smelling" aroma of sacrifices is that they soothe God when He's justifiably angry with sin, and they soothe God because they are a symbol of repentance and desire for forgiveness. Thus, it would simply be nonsensical for Noah to be depicted as the one who smelled his own sacrifice, and such a change not only defies logic but also the Hebrew language and the rest of the divinely-inspired Jewish authors of Scripture. The JST mistranslates "Cephus" to mean "seer." Did Joseph finish the translation of the Bible? The RLDS Church (now called Community of Christ) published the Joseph Smith re-translated Bible in 1867. However, the LDS Church doesn't regard this as scripture. According to the LDS Church, perhaps Joseph apparently never finished the work. Why didn't the next prophet, or any subsequent prophet, finish the inspired version of the Bible that the church thought was so important that they altered our version of the King James Bible to include the portions that Joseph did retranslate? Does it make any sense that the inspired version of the Bible should not be finished merely with the death of the first prophet of the restoration? If we really did have a succession of prophets since Joseph Smith, this important work would have been finished and published as God commanded Joseph to do. I once asked in Sunday school what would have happened if Joseph Smith was killed before he finished the translation of the Book of Mormon. Would the Book of Mormon have ended mid-sentence in 3rd Nephi if Joseph was killed at that point of the translation? I was told that the next person called to be a prophet would have finished the work with the same ability that Joseph had. That answer made sense to me. If we do indeed have a succession of prophets then we needn't fear the inevitable death of the current prophet. The work will continue with the next prophet. So does it make any sense that the inspired version of the Bible should not be finished merely with the death of the first prophet of the restoration? If we really did have a succession of prophets since Joseph Smith, this important work would have been finished. Why didn't Brigham Young, or any of the prophets that followed, finish the inspired version of the Bible that Joseph started? Joseph was commanded to finish it but it has never been published, why? Going back further, why didn't the New Testament end with the death of Jesus? Why didn't the Old Testament end with the death of Moses? The reason is that there was a succession of prophets that continued the work of the previous prophets until there was apostasy. Why would this end with the death of Joseph Smith unless that signaled another apostasy? Or perhaps the LDS Church doesn't have (or has ever had) any real prophets. Editor Comment: There seems to be some debate as to whether or not Joseph actually finished the inspired translation of the Bible before he was killed. From the LDS Church website: "Though he published some parts of the translation during his lifetime, it is possible that he would have made additional changes had he lived to publish the entire work. " However others disagree and said that the JST was ready to be published in its entirety before Joseph died. In either case, the prophets following Joseph should have completed the translation or should have known that the JST was complete and published it as the Lord commanded and as Joseph intended, if they were indeed prophets. The only apparent reason not to publish the JST in the 1840s would be if they didn't know what to do, which would be the case if they were ordinary men and not inspired prophets. Reference: LDS library article Joseph Smith's Efforts to Publish His Bible "Translation"
RLDS Joseph Smith Translation: Link is here. Why weren't some of the more serious Bible errors corrected? Editor comment: Some apologists say that Joseph covered this doctrinal error D&C 132:15-17 which they say correctly states the LDS view on eternal marriage. However, this provides another reason why Joseph should have corrected the marriage verses of the Bible when he did the JST so there would not be contradictions. Why bother translating the bible at all when he could merely correct all scriptural and doctrinal erros of the past by giving new revelations in the D&C? When the book of Genesis had been corrected by the Prophet the first time in 1830, the text he produced retained the Bible's (and Moses') emphasis that there is only one God although some original Genesis verses implied more than one hence making it confusing and another reason it should have been clarified in the JST. Joseph's 1842 translation of portions of the Book of Abraham, however, distinctly taught the plurality of gods as well as does the Book of Moses -- a concept of deity Joseph had started teaching a few years earlier, but one which many Saints neither understood nor appreciated. Why didn't Joseph correct this when he translated the Bible, including many, many verses he corrected in Genesis and not wait until he produced the Book of Abraham and the Book of Moses a decade later? Why wouldn't Joseph correct or clarify these scriptures that conflict so boldly with LDS doctrine? He did clarify the issue in the Book of Moses but why not the rest of the Bible like in Isaiah? The apologetic organization FAIR seems to miss the point that Joseph did not correct Genesis in 1830 when he was actually working on the JST of Genesis and it was only when he started the Book of Moses 12 years later did he correct these Bible errors using the Book of Moses, (which is essentially the JST of Genesis). Critics contend that this supports that Joseph's view of the nature of God evolved over time. FAIR acts as if MT doesn't know that the Book of Moses states that their are multiple gods when we clearly mention that above. The quotes FAIR gives "below" are all from the Book of Moses, not the original JST of Genesis he did a decade earlier which is the whole point of this subsection! However, not one of this verses is corrected to show the plurality of gods. Every verse shows God in the singular with the use of "i", "he", etc. The Judeo-Christian idea of a single, powerful head devil, whose purpose was to thwart the work of God (a sort of counterweight to the monotheistic God, almost equally powerful, equally omniscient, equally omnipresent), is a relatively late development. That notion did not exist in early Judaism. The "Satan" of the early Old Testament period was only a kind of prosecuting attorney, who at judgment would try to convince God to condemn the soul being judged. Only after the return from the Babylonian Captivity (late sixth century B. C. ) did Satan begin to be seen as God's almost-equal enemy, probably under the influence of Babylonian and Zoroastrian (Persian) beliefs in the duality of good and evil, represented by a good god and an evil god. To put it bluntly, the present Christian/Mormon idea of "the devil" is of pagan origin. The idea that the devil's name is "Lucifer" is of even later origin, and is based on a mistranslation. The name Lucifer appears in Mormon scripture at 2 Nephi 24:12, copied from Isaiah 14:12, as translated in the KJV: "How art thou fallen from heaven, O Lucifer, son of the morning!" The problem is a reliance by the King James translators on Jerome's Latin version from the 4th century A. D (!). The only place the word "Lucifer" occurs in the entire Bible is in the King James Version at this passage. Other more modern translations do not have "Lucifer" there (or anywhere at all), but translate the word correctly as "day-star," "star of the morning" or "morning star. " This passage, when read in context, is addressed to the king of Babylon, who was very proud and haughty and surrounded in worldly glory, but who was to be destroyed. "Lucifer" is used in Jerome's Latin (and, following Jerome, in the King James Version) to translate the Hebrew word 'helel', which means "morning star" (i. e. , the planet Venus). The Hebrew root 'h-l-l' means "shine" or "boast," so it is probably a taunting pun in the original Isaiah, written in Hebrew. There were two Greek names for the planet, both similar: either 'heos-phoros' meaning "dawn-bringer," or 'phos-phoros' meaning "light-bringer. " In the Septuagint (Greek) translation of this passage, probably made in the first or second century B. C. , the Hebrew 'helel' was translated with the Greek word 'heos-phoros. ' When Jerome translated the Bible into Latin, he used the Septuagint as his source and simply translated the Greek word for Venus into the Latin name of that planet, which is an exact translation of the Greek 'phos-phoros': luci-fer, from the Latin roots 'luc-' "light" and 'fer-' "bring, bear, carry. " It was not until well into the Christian era that the idea arose that "Lucifer" was a name, and that the verse applied to Satan and not to the king of Babylon. It is probably influenced by the (erroneous) assumption that Luke 10:18 (saying that Satan fell as lightning from heaven) is a reference to the Isaiah passage. Oddly, the only other place in the Bible where the term "morning star" ('phosphoros') is used is at 2 Peter 1:19, where it refers to Jesus! Revelations 2:28 and 22:16 also refer to the "morning star," meaning Jesus, but use a different Greek phrase made up of the Greek words for "morning" and "star. " One verse promises the "morning star" as a reward to the faithful; the latter verse is Jesus' saying "I Jesus . . . am the root and offspring of David, and the bright and morning star. " This error is compounded in Mormon theology, with Lucifer appearing as a character in the endowment ceremony in the Mormon temple. If Joseph Smith was truly inspired when he made his revisions, why didn't he correct this error? And why does this erroneous translation show up all over the LDS scriptures, in the Book of Mormon, where the erroneous translation is repeated word for word in 2 Nephi 24, as well as the Doctrine and Covenants and Pearl of Great Price? The inspired version of the Bible distributed by the RLDS Church contains many changes made by Joseph Smith to the Scriptures which do not appear in the LDS Church's official "Selections From the Joseph Smith Translation of the Bible. " This may be because some of these verses that Joseph translated have serious problems associated with them. JST Matthew 5:43 And whosoever shall compel thee to go a mile, go with him a mile; and whosoever shall compel thee to go with him twain, thou shalt go with him twain. This is particularly problematic to explain as a "clarification" - in the KJV and BOM Jesus says "Go the extra mile", and in the JST He says "Go exactly as far as you're asked. " This changes the message of the entirety of Christ's sermon in this passage, which is clearly to go above and beyond what's expected. Note: Twain means two. Virtually all of the modernized Christian versions of the Bible show this verse to say "If someone forces you to go one mile, go with him two miles. " Is the JST published by the RLDS Church correct? The RLDS Church (Community of Christ) published the entire JST of the Bible that Joseph completed in his life time, whereas the LDS Church only published about one-third of the translations. The problems that occur in the RLDS version are an issue only if those verses are also considered by the LDS Church as translated by Joseph Smith. Is that the case? This cannot be an unfinished translation of the Bible as indicated by this article in the June, 1992 Ensign under 'I have a Question':"Why does the LDS edition of the Bible not contain all of the corrections and additions made by Joseph Smith? " "While there were several reasons why the entire text of the Joseph Smith Translation was not incorporated in the 1979 LDS edition of the Bible, unreliability of the JST text was not one of them. Passages of doctrinal significance were given preference, and since space was a major factor, not everything was included. " "Because the translation was published by the RLDS church, some questions have existed as to whether it had been published accurately. However, research in the past few years with the original manuscripts has indicated that the Inspired Version of the Bible, published by the RLDS church, is an accurate representation of the sense of the original manuscripts prepared by Joseph Smith and his scribes. " May I be pardoned if I say that negative attitudes and feelings about the Joseph Smith Translation are simply part of the Devil's program to keep the word of truth from the children of men. Of course the revealed changes made by Joseph Smith are true, as much as anything in the Book of Mormon or Doctrine and Covenants! Of course we have adequate and authentic original sources showing the changes, as much so as are the sources for the Book of Mormon or the revelations! Of course we should use the inspired translation, the Joseph Smith Translation, in our study and teaching! Since when do any of us have the right to place bounds on the Almighty and say we will believe these revelations and not those? So based on the above quotes by LDS sources, the JST published by the RLDS Church represents true translations of Joseph Smith. Therefore, if inaccuracies in these translations can be found, that should be a serious concern to Latter-day Saints. JST Luke 10:22 (emphasis added) All things are delivered to me of my Father: and no man knoweth that the Son is the Father, andthe Father is the Son, but him to whom the Son will reveal it. In 1 Timothy 2:4, Joseph expands the verse to clarify that the Father and Son "is one God." This view is consistent with Joseph's other scriptural writings of 1829-34 but not with his later thought. All of these JST changes suggest that they were personal insights rather than authoritative statements or reflections of the intent of the original authors. Reference: An Insider's View of Mormon Origins, Grant Palmer, pp 11-12. 3 Nephi 25:2 But unto you that fear my name, shall the Son of Righteousness arise with healing in his wings; and ye shall go forth and grow up as calves in the stall. It is interesting to note that an article published in 1822 in Canandaigua, New York, (a few miles from where Joseph Smith lived) makes the same mistake in discussing Malachi 4:2, quoting it as "Son of Righteousness" (cited in David Persuitte, Joseph Smith and the Origins of the Book of Mormon (second edition) p. 131). Apostle Bruce R. McConkie, in his Mormon Doctrine, article "Son of Righteousness" treats 'son' and 'sun' as having the same meaning. It appears that Mormon theology works only in English. Note also that where Malachi says ". . . ye shall. . . grow up as calves of the stall" Nephi says ". . . ye shall. . . grow up as calves in the stall. " That is insignificant. Note: Joseph made a number of handwritten manuscripts of his corrections to the Old and New Testament. Old Testament Manuscript 2 is one of those and includes a short mention that the book of Malachi is "correct. " There was no text copied. The RLDS Bible includes the KJV text but with no notation that Joseph Smith considered it correct as printed in the KJV. Isaiah 14:19 (KJV) says: "But thou art cast out of thy grave like an abominable branch, [and as] the raiment of those that are slain. . . " The Hebrew word translated as "raiment" is 'lebush', which appears 28 times in the Bible, translated variously in the KJV as "clothing," "apparel," "garment," "vestment," "vesture," and, here, as "raiment. " This passage also appears in the Book of Mormon at 2 Nephi 24:19, but "raiment" is replaced by "remnant. " Joseph Smith's "inspired" version of the Bible also has "remnant. " 2 Ne. 24: 19 But thou art cast out of thy grave like an abominable branch, and the remnant of those that are slain, thrust through with a sword, that go down to the stones of the pit; as a carcass trodden under feet. The explanation is quite obvious: Joseph Smith, in dictating the Book of Mormon to his scribe, and reading from his King James Bible, said "raiment" correctly, but the scribe mis-heard "remnant. " And Joseph never caught the error. " "Remnant" may actually make sense in the context. I would think that when a body is cast out of a grave there is only going to be a remnant of that body left. This is probably why Smith didn't catch the error. It remains a problem, though, since one must explain how the original Hebrew text incorrectly replaced a word meaning "remnant" with a quite different-sounding Hebrew word, and the only thing the two had in common was the similar sound of their ENGLISH equivalents! English is the ONLY common denominator between the two Hebrew words. What an amazing coincidence! by Logan Williams. We would like to thank Logan for permission to include this on our site. To see the original post, and view the Hebrew fonts associated with it, please check out the post on "The Two Cities" blog. On April 7, 1844, just before his death in the following month, Joseph Smith delivered a sermon commonly referred to as "The King Follet Sermon" (or "The King Follet Discourse"). It is, according to the LDS Church, considered to be "one of the classics of Church literature. "1 The sermon was delivered on the occasion of the funeral of King Follet, a late member of the LDS Church and friend of Smith. This sermon contains some of the most distinctive elements of LDS theology, specifically the belief that God the father is an exalted man. The following post is not meant to be attacking or denunciating towards Mormons. But I do think some of Joseph Smith's statements warrant discussion, and this post is the first step in starting a dialogue that I think is overdue. In this post, I want to look at one paragraph in the King Follet Sermon that provides some pretty interesting Hebrew translation and exegesis.2 (This paragraph is, I may add, something that we definitely know Joseph Smith said in this sermon. See note 2 below). Here is what I think is one of the most peculiar paragraphs in the King Follet Sermon. "I shall comment on the very first Hebrew word in the Bible; I will make a comment on the very first sentence of the history of creation in the Bible-Berosheit. I want to analyze the word. Baith-in, by, through, and everything else. Rosh-the head, Sheit-grammatical termination. When the inspired man wrote it, he did not put the baith there. An old Jew without any authority added the word; he thought it too bad to begin to talk about the head! It read first, 'The head one of the Gods brought forth the Gods.' That is the true meaning of the words. Baurau signifies to bring forth. If you do not believe it, you do not believe the learned man of God. Learned men can teach you no more than what I have told you. Thus the head God brought forth the Gods in the grand council." - Joseph Smith, King Follet Sermon. May 1971 Ensign, pg. 13. Maybe the most interesting observation about his exegesis here is that Smith's official translation of Genesis 1:1 does not line up with his translation in The King Follet Sermon. Why does the JST say "In the beginning" if (as Smith claims) there was originally no baith? It seems that the exact translation that Smith argues against in The King Follet Sermon is actually what he supports in the JST. This is especially interesting because Genesis 1:1 (=1:3 JST) is one of the verses that Joseph Smith changed from the KJV. Why, according to Joseph Smith's claims, are there two different (and opposite!) accounts of how we should translation Genesis 1:1? This becomes a bit more problematic when Smith says, "If you do not believe it [my translation], you do not believe the learned man of God. Learned men can teach you no more than what I have told you." The odd thing is, if you agree with the JST, then you do not believe the "learned man of God". What happened to "the heavens and the earth"? reshith = "A head" as the subject of the sentence. This is supposedly conceptually referring to "A head [of one of the gods]" in which "of one of the gods" is unstated but implied. This, however, is problematic because the Hebrew counterpart to "head" is (rosh) not (reshith). Reshith means "beginning". In the above account Smith thinks the first word of Genesis is a combination of baith (in), rosh (head), and sheit ("grammatical termination"), when actually it is a combination of baith (in) and reshith (beginning). bara = "brought forth" as the main verb of the sentence. elohim = "gods" as the object of the verb "brought forth". So, "The head [of one of the gods] brought forth the gods". The syntax constituted by this reading is very awkward in Hebrew. bereshith = "In beginning" as a time marker for the following clause. bara = "created" as the main verb of the sentence. Elohim = "God" as the subject of the verb "created". et hashamayim wa-et ha-arets = "the heavens and the earth" as the object of the verb "created". Blue: main differences in Genesis 1:1a. Red: major grammatical discrepancy. 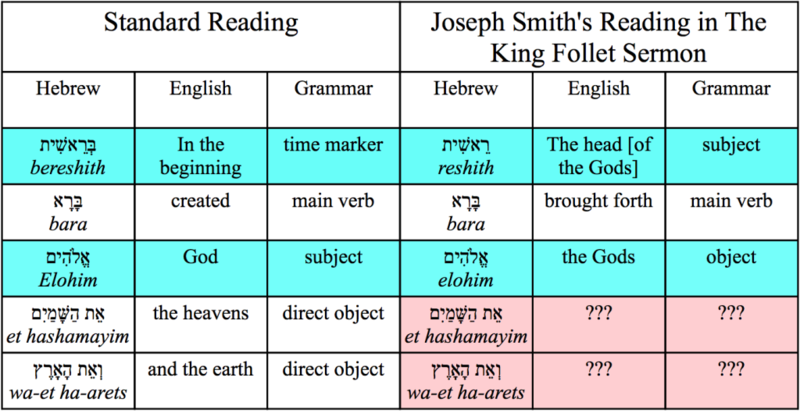 The exegesis presented in The King Follet Sermon creates a pretty big grammatical issue: in Smith's translation, "Gods" is now the object of the verb bara; if that is the case, what then happened to the original direct object "the heavens and the earth" in the other half of Genesis 1:1? 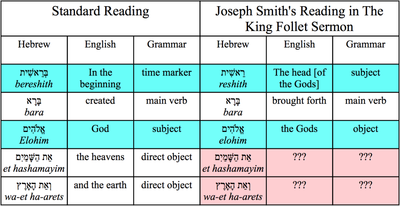 The major issue with Smith's exegesis is that, in the Hebrew, the nouns "the heavens" and "the earth" each have grammatical markers that indicate that they are direct objects of the main verb. Specifically the word "et", which precedes both "the heavens" and "the earth", signals to the reader that the following word functions as a direct object. But, as we saw above, according to Smith the direct object of "created" is "the Gods". So what happened to "the heavens and the earth" as the direct object? This time, Smith doesn't claim that some old Jew added this phrase. The English equivalent to Smith's rendering of the Hebrew would be "The head brought forth the Gods the heavens and the earth." It obviously just doesn't work. The fact that Smith fails to comment on the presence of "the heavens and the earth" is quite confusing to any student of biblical Hebrew, since in Smith's reading there does not seem a way to fit "the heavens and the earth" into the sentence grammatically. I await an appropriate explanation of this grammatical issue. Joseph Smith makes quite the text-critical claim about Genesis 1:1, namely that the initial baith was absent in the original manuscript. This is a unique claim: in regards to the JST, it often claimed that Smith is expanding, clarifying, etc. rather than recording what was in an original manuscript. In The King Follet Sermon, however, we have a unique case: Smith specifically states that the most original manuscript lacked the initial letter baith. In contrast to Smith's proposition, no extant ancient Hebrew manuscript to date has lacked this letter. For example, one of the most ancient manuscripts of Genesis 1:1 (if not the oldest) from the Dead Sea Scrolls (cave 4 of Qumran) is identical to every other Hebrew manuscript throughout history in that it includes baith. This manuscript, 4QGeng , dates back to around 50 B.C.. Moreover, the Greek translation of the Hebrew, the Septuagint (LXX), dating back to around 250 B.C., demonstrates that the translators were using a Hebrew manuscript that included the Hebrew letter baith (the first word of the LXX corresponds to the Hebrew letter baith ). Thus, with Joseph Smith's claim, the textual error of including the baith must have happened sometime before 250 B.C.. This is a lofty claim! And if it was only one Jew who decided to include the initial letter baith, then, I think, we should have at least have one manuscript by now that reflects the actual original. It should be surprising to LDS scholars that there has yet to be a manuscript found (or even a translation) that reflects the absence of the letter baith. These are a few of my observations (and confusions) about the Hebrew exegesis presented in The King Follet Sermon. Again, in case you thought otherwise, this post is not supposed to be polemical or "anti-Mormon". Rather, it is meant to foster civil discussion about one text that is peculiar and confusing to me (and others). I am open to discussion about the sermon and the translation therein! For further reading, see a more full analysis at "Joseph Smith's Translation Of Genesis 1:1? by Jews for Judaism and Kevin L. Barney's study in Diaolgue: A Journal of Mormon Thought. 1. "The King Follet Sermon"">"The King Follett Sermon," Introductory notes. Accessed June 16, 2015. 2. There are four extant manuscripts recording The King Follet Sermon. The standard text is reproduced from two accounts, those of Tomas Bollock and William Clayton. Concerning the main paragraph quoted at the beginning of this post, all four independent written accounts of the sermon include evidence that Smith indeed made the claims in that paragraph. Wilford Woodruff notes specifically Joseph Smith's point about the purported absence of baith (and its corresponding translation) JS, Discourse, Nauvoo, IL, 7 Apr. 1844; in Wilford Woodruff, Diary, p. 136; handwriting of Wilford Woodruff; CHL. Accessed here June 16, 2015. Thomas Bullock includes most of the main points of in his account of Smith's sermon. JS, Discourse, Nauvoo, IL, 7 Apr. 1844; handwriting of Thomas Bullock; p. 17; General Church Minutes, CHL. Accessed here June 16, 2015. William Clayton includes both the point about the baith and the relative translation as well. JS, Discourse, Nauvoo, IL, 7 Apr. 1844; handwriting of William Clayton; p. 15; General Church Minutes, CHL. Accessed here June 16, 2015. Willard Richards notes at least Joseph's translation of Genesis 1:1. JS, Discourse, Nauvoo, IL, 7 Apr. 1844; in JS, Journal, 1 Mar. 1844-22 June 1844, p. 68; handwriting of Willard Richards; JS Collection, CHL. Accessed here June 16, 2015. Although it is claimed that some of the points in the sermon were not heard fully or not completely recorded, the presence of four, independent, written sources recording what Smith said corroborates the historical certainty that the all the points in the quoted paragraph above were made by Smith. We regret that we could not find these issues discussed comprehensively in any church publication or website. However, we found responses from LDS apologists for some of the problems cited above, but not for all of them. Joseph had different purposes in mind in his different translations. This is not unique or unusual in scripture -- even the Bible. Hence, neither the Book of Mormon nor the Joseph Smith Translation of the Bible can be discounted because of seeming discrepancies with each other or with the King James Version of the Bible. The biblical quotes in the Book of Mormon do not incorporate the changes made in the Joseph Smith Translation of the Bible indicating that one or both of these translated documents by Joseph Smith are in error. Joseph's inspired translation did not correct a single major error that scholars have discovered in the King James Version text or correct any significant errors according to LDS doctrine. Some of the JST verses that have been published by the RLDS church, but not the LDS church, completely change the meaning of the original Biblical verses. Some of these changes are completely nonsensical. None of JST has been supported by any of the ancient biblical manuscripts found since Joseph wrote the JST. In conclusion, we are convinced that the archaeologists, linguists, textual critics, and other scholars who study the Bible have done far more to help us understand the Bible than Joseph Smith. We believe Smith inserted his own theology into ancient books, whether it made any sense or not. Bruce R. McConkie said that the Inspired Version is the best Bible on earth today. Personally, we recommend a real translation done by proven scholars. The JST of the Bible is almost ignored by the church. Although the footnotes with the correctly translated passages are in our current Bibles, they are rarely discussed. Very few LDS even know of any problems associated with the JST. Each time linguists make a new Bible translation such as the NIV, The Message, NKJV, etc. , they all go back to the original sources and try to use new information such as the Dead Sea Scrolls in making the translations, and not one to date has confirmed any of Joseph Smith's inspired version passages. As LDS historian Grant Palmer states: "Unfortunately, none of the significant additions or deletions have been supported by the numerous Old and New Testament manuscript finds since 1833. The discovery of the Dead Seas Scrolls provided us with Hebrew manuscripts for all of the Old Testament (except Esther) that are a thousand years earlier than any previously known (100 B. C. ). Manuscripts for New Testament texts now date to about A. D. 200. We could expect that with these many discoveries over the past 172 years, some important confirming evidence should be available for Joseph's alterations of the Bible. Such is not the case. " Reference: An Insider's View of Mormon Origins, Grant Palmer, pp 11. All of the evidence that could be used to show that Joseph could actually translate ancient documents has failed to provide any support to his translating ability such as the Book of Abraham facsimiles and papyri, the Anthon Manuscript, the Kinderhook Plates, Joseph Smith's Book of Egyptian Alphabet and Grammar and the Greek Psalter. We must add the JST of the Bible to this list. It fails to support Joseph's translating ability and adds new problems to reconcile. It remains that Joseph's only "qualification" to translate anything was his own word. None of Joseph's many translations have been supported by any modern-day research and significant contradictory evidence exists for much of his claimed translated material. "Back when I was on my mission in Sydney, Australia, Dallin Oaks visited and addressed our mission conference. I don't remember the missionary's name who asked the question or the exact scripture that was bothering him but I distinctly remember that it had to do with a passage in Isaiah with a JST correction -vs- the BOM. As you might guess they don't agree. I think I remember him saying that he had investigators who asked the question and he didn't have an answer. Well, neither did Dallin. To paraphrase his answer: "Well elder, that is a very specific question. I, however am a general authority and can answer general questions. I will have to refer you to a specific authority: your mission president. . . "
LDS library article Joseph Smith's Efforts to Publish His Bible "Translation"